FEATURES - Waterproof Pressure Resistance: 600 mm, matte finish eyelets and zippers, #4 zipper with zipper pull & rubber zipper pull tab, reversed zipper tape, fine mesh hood liner, three panel hood, scuba neck for increased protection from the weather, welt pockets with mesh pocket bags, tightening toggle at waistband, elastic cuffs, locker loop in center back to hang garment. 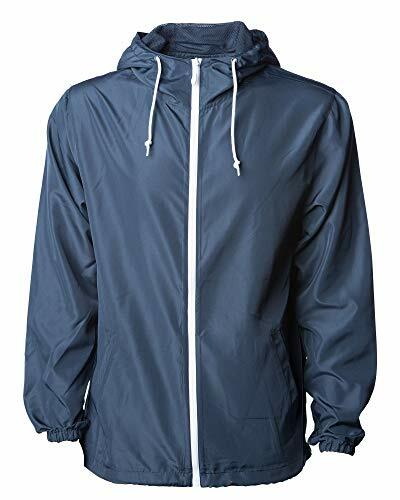 STYLISH - This urban style light wind proof jacket is the perfect lifestyle garment for men or teen boys. 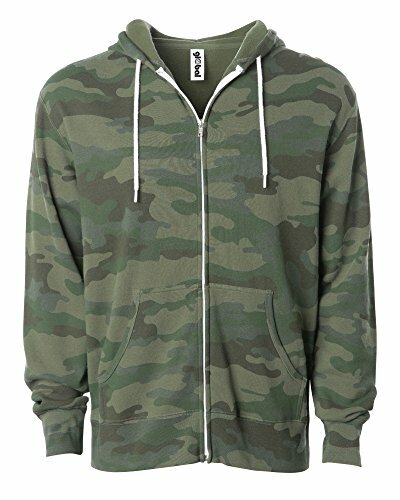 Its great with jeans, shorts, sweatpants, back to school, rain or snow gear, skate attire, surfing apparel. This lightweight hooded coat is great as a last layer to keep dry or easily allows you to layer for warmth with a relaxed look. This clothing top is easy and perfect for those times that didn't think you would need a jacket. 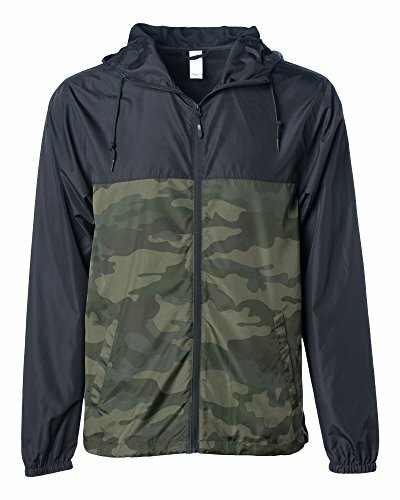 GREAT FOR ANY OCCASION - A long sleeve hooded windbreaker is perfect for the beach, casual running, hunting, fishing, camping, hiking, work, gym, walking, outdoor activities, skating, soccer, softball, sports practice. Great for spring, fall, winter layering and summer uv protection. This full zip up can be packet into its own pocket to about the size of a tennis ball making it practical to take everywhere! QUALITY CONSTRUCTION - All seams are split stitch double needle sewn, making this outerwear shell style jacket fashion forward, attractive and durable. Comparable to major brands. TRUE TO SIZE - For a looser fit order size up. Hassle free return policy on our apparel allows you to shop for our clothes risk free. FEATURES - Water Resistance: 600 mm, matte finish eyelets and zippers, #4 zipper with zipper pull & rubber zipper pull tab, reversed zipper tape, fine mesh hood liner, three panel hood, scuba neck for increased protection from the weather, welt pockets with mesh pocket bags, tightening toggle at waistband, elastic cuffs, locker loop in center back to hang garment. 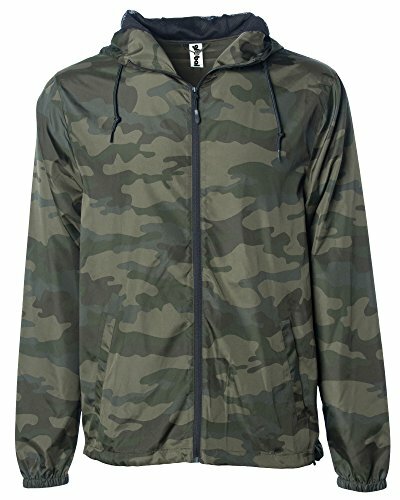 GREAT FOR ANY OCCASION - A long sleeve hooded windbreaker is perfect for the beach, casual running, hunting, fishing, camping, hiking, work, gym, walking, outdoor activities, skating, soccer, softball, sports practice. Great for spring, fall, winter layering and summer UV protection. This full zip up can be packed into its own pocket to about the size of a tennis ball making it practical to take everywhere! 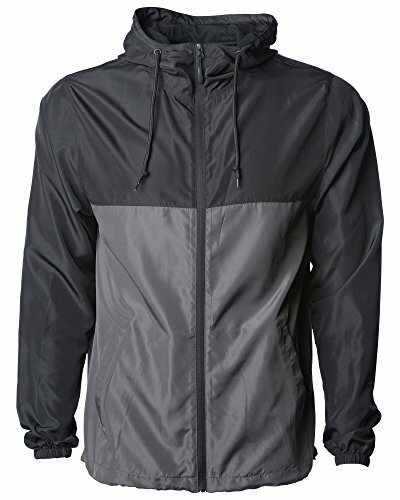 STYLISH - This urban style light wind proof jacket is the perfect lifestyle garment for men or teen boys. Its great with jeans, shorts, sweatpants, back to school, work wear, rain or snow gear, skate attire, surfing apparel. This lightweight hooded coat is great as a last layer to keep dry or easily allows you to layer for warmth with a relaxed look. This clothing top is easy and perfect for those times that didn't think you would need a jacket. QUALITY CONSTRUCTION - All seams are split stitch double needle sewn, making this outerwear shell style jacket fashion forward, attractive and durable. Comparable to major brands at a fraction of the cost. SLIM FIT DESIGN - For a looser fit order size up. Hassle free return policy on our apparel allows you to shop for our clothes risk free. FEATURES - Water Resistance: 600 mm, matte finish eyelets and zippers, #4 zipper with zipper pull & rubber zipper pull tab, reversed zipper tape, fine mesh hood liner, three panel hood, scuba neck for increased protection from the weather, hand pockets with mesh pocket bags, tightening toggle at hem, elastic cuffs, locker loop in center back to hang garment. 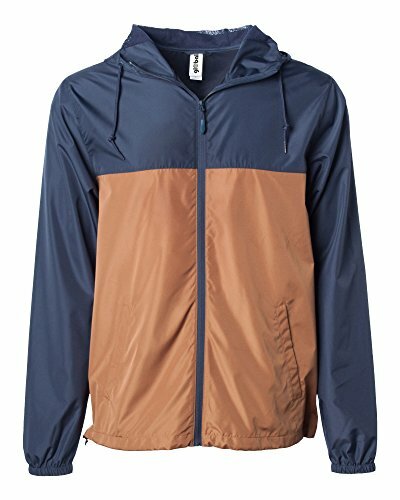 GREAT FOR ANY OCCASION - A long sleeve hooded windbreaker is perfect for the beach, casual running, hunting, fishing, camping, hiking, work, gym, walking, outdoor activities, skating, soccer, softball, sports practice. Great for spring, fall, winter layering and summer UV protection. This full zip up can be packed into its own pocket to the size of a tennis ball making it practical to take everywhere! FEATURES - Water Resistance: 600 mm, matte finish eyelets and zippers, #4 zipper with zipper pull & rubber zipper pull tab, reversed zipper tape, fine mesh hood liner, three panel hood, scuba neck for increased protection from the weather, hand pockets with mesh pocket bags, draw cord adjustable hem, elastic cuffs, locker loop in center back to hang garment. 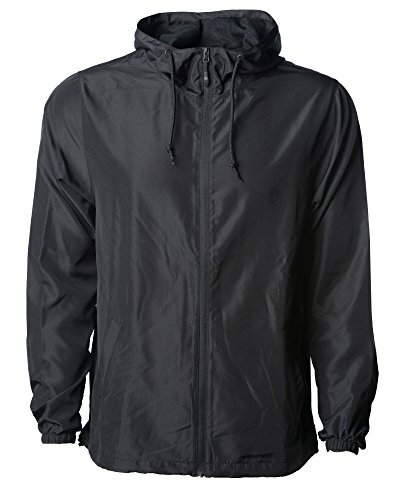 STYLISH - This urban style light wind proof jacket is the perfect lifestyle garment for men or teen boys. Its great with jeans, shorts, sweatpants, back to school, rain or snow gear, skate attire, surfing apparel. This lightweight hooded coat is great as a last layer to keep dry or easily allows you to layer for warmth with a relaxed look. This clothing top is easy and perfect for those times that you didn't think you would need a jacket. 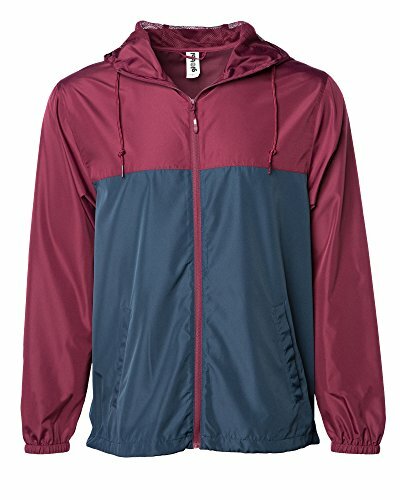 GREAT FOR ANY OCCASION - A long sleeve hooded windbreaker is perfect for the beach, casual running, hunting, fishing, camping, hiking, work, gym, walking, outdoor activities, skating, soccer, softball, sports practice. Great for spring, fall, winter layering and summer UV protection. This full zip up can be packed into its own pocket to the size of a tennis ball making it practical for everywhere you travel! FEATURES - Available in a variety of basic and fun vibrant colors , from classic black and vintage navy blue to a bright red and camo. This long sleeve full front zipper pullover brings a sporty vintage look with contrast white zipper tape and drawstrings. 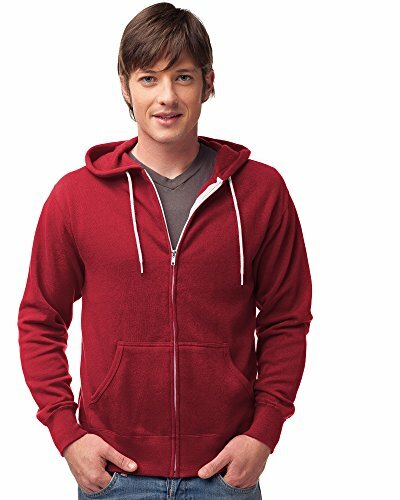 These slim fit hooded sweatshirts have and unlined hood, kissing zipper, front pouch kangaroo pockets, nickel eyelets and zipper pull. 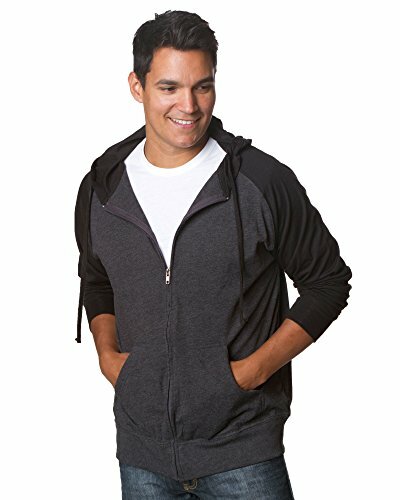 STYLISH - This light slim fit urban style zip-up design is the perfect lifestyle garment for guys, juniors, big boys and teen kids, girls, women, and juniors. Its great with jeans, shorts, sweatpants, back to school, work wear, slacks, skate attire, surfing apparel. Lightweight material that breathes easy allows you to layer for warmth with a relaxed look. This versatile clothing top is easy to pack, and perfect for those times that didn't think you would need a jacket. QUALITY CONSTRUCTION - All seams are split stitch double needle sewn, making this light zip jacket, fashion forward, attractive and durable. Comparable to major brands at a fraction of the cost. SIZING - MEN'S SIZES LISTED, WOMEN SHOULD ORDER A SIZE DOWN ( Mens Medium = Womens Large) For a looser fit order size up. Please refer to size chart and reviews for measurements and recommendations if you are a first time buyer. Hassle free return policy on our apparel allows you to shop for our clothes risk free. 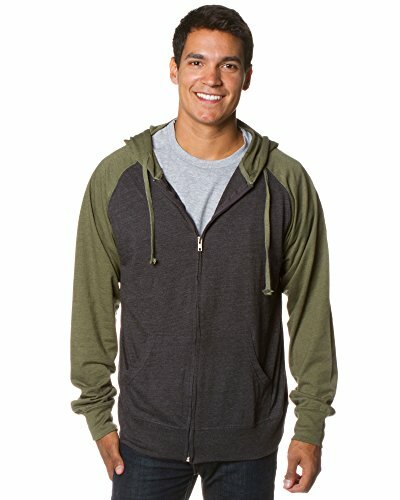 GREAT FOR ANY OCCASION - A long sleeve full zip sweatshirt is perfect for the beach, casual running, hunting, fishing, camping, hiking, work, gym, walking, outdoor activities, skating, soccer, softball, sports practice, traveling, cycling, mountaineering, rock climbing, riding, driving, bowling and maternity clothing. Great for summer sun protection, this full zip up can be practical to take everywhere with style! QUALITY CONSTRUCTION - All seams are split stitch double needle sewn, making this outerwear super soft jacket fashion forward, attractive and durable. Comparable to major brands. This top is designed to be sturdy and long lasting to endure your active lifestyle wash after wash. 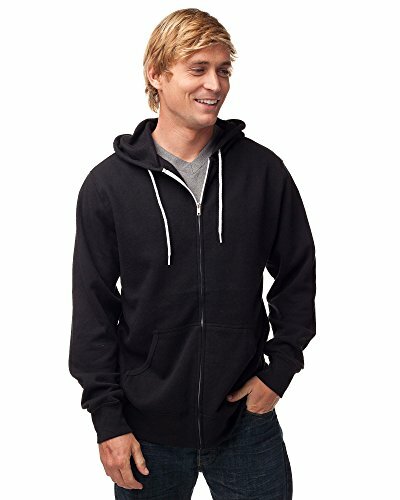 Gentle to the touch this classic hoodie will get softer over time and become a regular favorite. MEN'S SIZES LISTED - Women order one size down (i.e. Men's Medium = Women's Large) TRUE TO SIZE UNISEX SLIM FIT- For a looser fit order size up. Hassle free return policy on our apparel allows you to shop for our clothes risk free when returned in new condition. 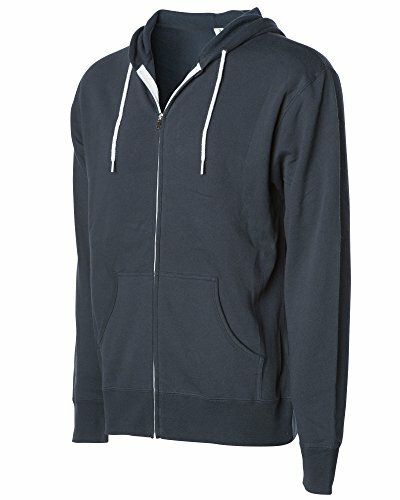 FEATURES - 7.5 oz (250 gm) pre-laundered 70% cotton/30% polyester blend French terry--Black & Charcoal Heather 55% cotton/45% polyester blend French terry,32 singles face yarn for supreme printability and softness. 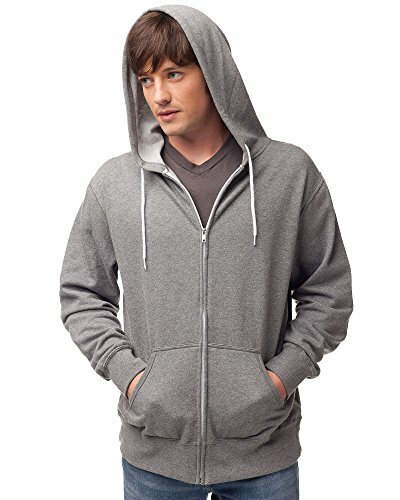 Unlined hood, split stitch double needle sewing, antique nickel eyelets, two antique nickel tipped flat drawcords (one contrast + one matching), media pocket and eyelet in front pocket for headphone jack and cord, thumbholes at cuffs. This garment is not waterproof or water resistant. WARMTH & PROTECTION: Abrasion-resistant wind protection and a gridded fleece backing make this the ultimate layer for breathable warmth during active outdoor adventures. With a relaxed fit and soft, micro-gridded back, it's the perfect men's windbreaker. 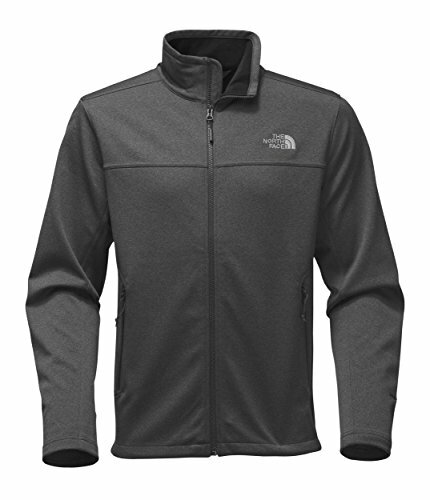 JACKETS FOR EVERY WEATHER: The North Face has been a trusted name in outdoor gear for over 60 years. 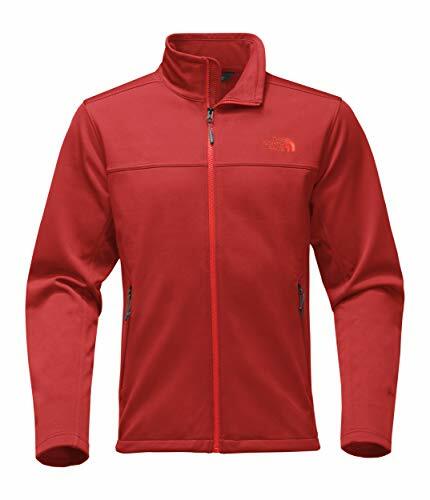 Whether you're looking for rain coats, parkas, ski jackets, pullovers, windbreakers, or vests, The North Face has the quality jackets you're looking for. 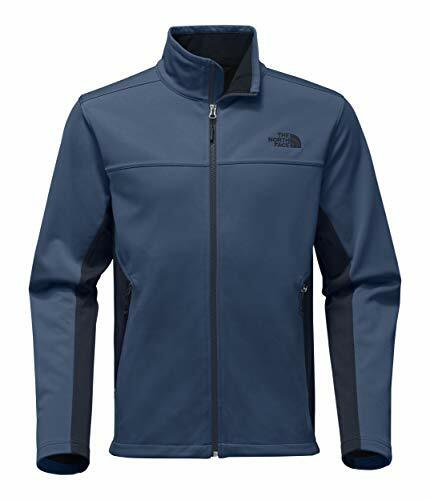 OUTDOOR APPAREL: Whether you're skiing, snowboarding, camping, hiking, training, running, or climbing, The North Face has the exceptional apparel you need for your active, outdoor life. Trust the North Face to keep you warm & dry in the great outdoors. THE NORTH FACE MISSION: Provide the best outdoor gear for athletes & the modern day explorer, support the preservation of the outdoors, and inspire a global movement of exploration. Try our packs, sleeping bags, hiking boots, sandals and outdoor clothing. QUALITY OUTDOOR GEAR: Compare The North Face's trusted quality outdoor gear to jackets, hiking boots, backpacks or other outdoor gear from Osprey, Jansport, Thermarest, Nike, Teton, Maxpedition, High Sierra, Dakina, Eureka, Camelback, Under Armour & more! FEATURES - Available in a variety of basic colors and two tones, from classic black and vintage navy blue to army charcoal raglan long sleeve to the full front zipper royal blue and dark grey. 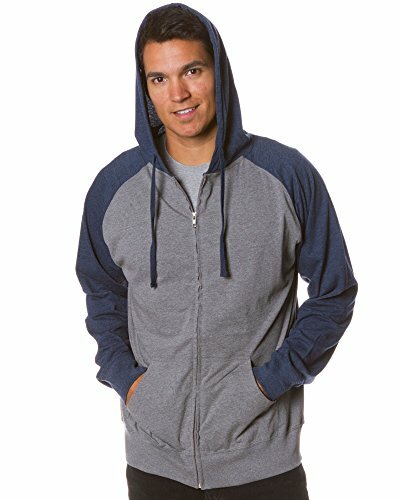 This slim hooded sweatshirt is like a longsleeve breathable t shirt with a hood, front pouch pockets and a zip closure, making it a versatile year-round clothing staple when it comes to light winter layering, staying warm on a cool spring jog, or a night time baseball game in the summer. STYLISH - This light classic design is the perfect lifestyle garment for guys, juniors, big boys and teen kids. Its great with jeans, shorts, sweatpants, back to school, work wear, hunting gear, slacks, skate attire, surfing apparel. Thin Tee style material that breathes easy allows you to layer for warmth while looking cool. This is a versatile sports top is easy to pack, and perfect for those times that didn't think you would need a jacket but are glad you brought one. 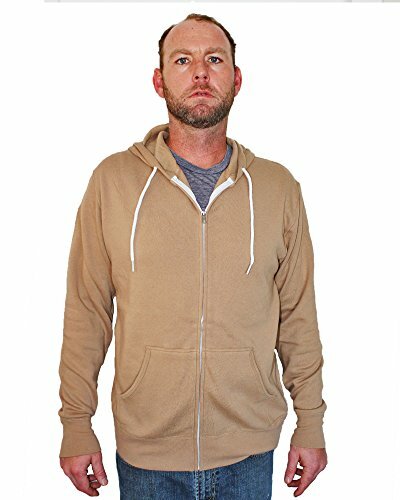 GREAT FOR ANY OCCASION - A long sleeve hoodie sweatshirt perfect for jogging, track, running, casual events, college parties, work, vintage sports look, gym, gaming, walking, golf, outdoor activities, beach, skating, soccer, softball, pilates, yoga, practice training and many more times you find yourself in need of a little extra warmth with full sleeve tee shirt outerwear. 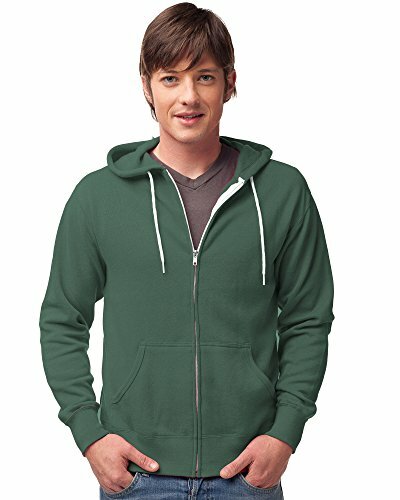 QUALITY CONSTRUCTION - All seams are split stitch double needle sewn, making this light T-shirt zip jacket hoodie, fashion forward, attractive and durable. SIZING - for a looser fit order size up. Please refer to size chart and reviews for measurements and recommendations if you are a first time buyer. Hassle free return policy on our apparel allows you to shop for our clothes risk free.